Today, we will be looking into one of the exchanges that you might have tried out in the past. We will be looking into Coinut.com and try to look for its advantages and disadvantages throughout a series of important points that we will be discussing one by one. This review will include the regulations and restrictions of Coinut.com, their background, the verification process along with creating an account, how to trade with them, look into their website’s features, how to deposit and withdraw and a lot more. Without further delay, let’s talk about that! First and foremost, we need to look into the company’s regulations and restrictions to know if we are eligible to create an account or does our country of residence have issues with them. As we all know, there are some trading websites out there that do not accept clients from the United States due to the laws in their country prohibiting such trades. Good thing that Coinut.com, a cryptocurrency based exchange does not have any restrictions whatsoever, making it easier for our friends around the world to create an account with them. What we’ve noticed is that most of the cryptocurrency exchange websites today are mostly unregulated trading websites that go around promising people that they would not run away with their money. This is literally what’s happening today. Now we all know the advantages of using BTC in online transactions right? All the transactions are virtually untraceable, giving the user that ultimate feeling of anonymity. But it does come with a price when talking about online trading with websites that operate solely on BTC or cryptocurrencies since there is a huge chance that they are not registered with any formal regulatory body that checks the trades. The Monetary Authority of Singapore or better known as MAS announced its future plans to approve digital money to regulate exchange websites such as Coinut.com. You can read more about it here. What’s really exciting is that Singapore is going towards a brighter cryptocurrency future which looks good for a Singaporean based crypt-trading website! In other words, this company has a bright future offering crypto trades. The company Coinut Pte. Ltd., has been running since 2013 and has no major reports about the company’s reputation or hack problems. If you have any unresolved issues, please do let us know in the comment section below. Anyhow, the company was founded by Xinxi Wang, and you can check his Twitter profile here. The website practices cold storage, or in other words, they store client’s crypto currencies in an offline wallet away from possible hacks. What’s cool is that Singapore isn’t shy about showing what technology can do, with this being said, the registration of the company can be seen in one of their government websites. To check the company’s registration, all you need to do is copy their Unique Entity Number (UEN) which is 201332271K and paste it into the search bar found on this website. Their office address is at 10, Anson Road, #26-04, International Plaza, Singapore 079903. We would like to give props to Singapore’s government website since it didn’t have any lags whatsoever. Now that we’re done looking into the website’s regulations and about their background, it’s time to move on and look into how to get an account verified with them. Verification can mean a couple of things when it comes to creating an account with online trading websites. One would be the fact that an account needs to be verified a few times in order go up an account hierarchy. What other websites do is that they block higher trades with verification procedures that limit a regular (stock) account that was just made. If you’re not new in the trading scene then you probably know what we’re talking about. For our friends that are new to trading online, websites do have such restrictions and verification levels that you need to go through. Coinut.com is a cryptocurrency website but they accept USD deposits and withdrawals, this will be discussed later in this review. The first thing we need to do is, of course, head on to their website. Click on the Signup button found on the upper right-hand side of the website’s homepage. To create an account all you need to do is provide the username for your new account, active email address, the password for that account and phone details. Once that has been filled up, enter the CAPTCHA code (which we had a hard time since the font color was yellow) on the provided box. If you have problems viewing the code, just click on the code and this will generate a new one. 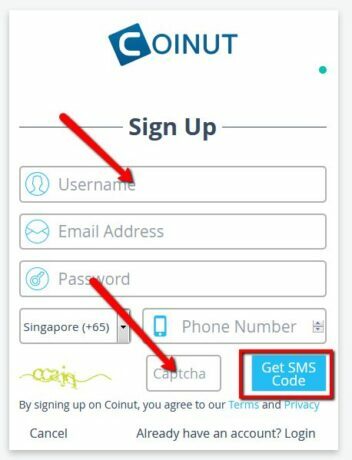 After providing the code, click on Get SMS Code. An additional box will be provided once this has been clicked, provide the SMS code in the provided box and click Sign Up. Now we’re almost done with the registration process, yes, almost. The next and final step is to log into the provided email address and click on the confirmation email. Congratulations! We have successfully created an account with Coinut.com, what now? Now we’re going to try and trade with them. After account creation and login, the user will be directed immediately to the trading page where all the magic happens. Trading is actually pretty straightforward when it comes to their trading platform. But that comes from a team that has been reviewing trading platforms for a very long time. Does it feel that way if you are a new trader? Definitely not! 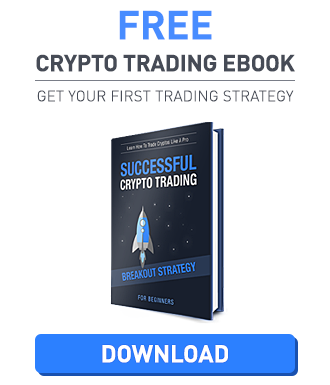 The website is not a “newbie friendly” website where you are able to figure out everything that’s going on if you do not have any idea on how trading platforms work. We asked a friend that has no idea on how trading works and it took her more than an hour to figure out what the tabs and panels are for. 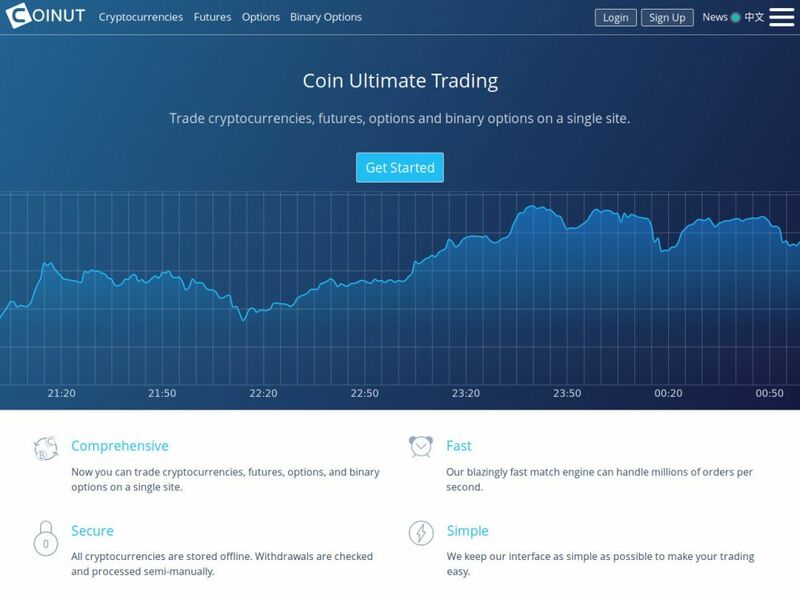 On the provided screenshot above, we are able to see the trading/exchange platform of Coinut.com. Found on the left-hand side of the screen are the details needed for you to purchase or exchange cryptocurrencies at. Choose the crypto you want to trade with and this would have a pair. On the example screenshot, we are able to see the pair LTC and USDT. Once a pair has been chosen, this will automatically show the chart in the middle of the screen. The chart can be adjusted to show different indicators depending on what you would need to create a trade. Every person has their own preference, we leave this out to you to explore. Going back to the trade panel, we can see below the Market tab would be the trade itself. You can either choose Limit or Market purchase. Once a successful order has been made, this will then be transferred to the “Open Limit Orders” tab found in the center part of the screen just right below the chart. A registered user can also view other buyers and other seller’s postings on the same page making it easier to look into recent orders without moving too much from one tab to another. On the far right side of the screen, we’ve got the menu opened up. 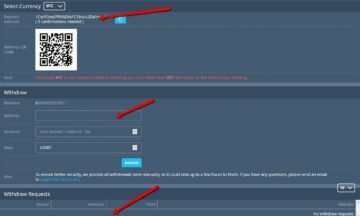 Here the user is able to access everything from Settings, Fees, FAQ’s, Forum, and their Terms and conditions along with other tabs that can be found on the trading page. Margin Trading – At this moment in time, Coinut.com does not support leverage trading or margin trading. This is not surprising since if not all, most of the cryptocurrency exchange websites today do not have this feature. Fees – Aside from learning how to trade with their website, it would also be wise to know about the trading fees. To be honest, there are a couple of websites today that have been gearing towards free maker fees. Coinut has also steered to that direction with going free for their maker fees. They only charge the taker which is only 0.1% and is lower compared to other exchange websites that would reach 0.25% on Taker fees. To read more about the complete list of fees, please click this link. What awesome is that the company has taken the initiative to go with the free maker trend because they know that makers are the ones fueling the exchange economy. Removing fees makes it easier for makers to offer a substantial amount of orders without having to think about fees. This is why Coinut.com is one of the top 100 exchange websites today due to their daily volume capacity. We have found a video on YouTube that can be of great help for people that are new to trading and new registered users of Coinut.com. The video volume is weak, but it’s enough to be understood. Features are the backbone of a website, they give a website life and people find interest in these features. What does Coinut.com have for us? They have a multitude of features that might interest a person just like you! First would be their website interface, though it is not complete a “feature” they have the nicest interface we had been so far. The tabs load really fast and you do not have any problems going in and out of different panels. Below are important features that we want to point out. Referral – The website offers a really good deal of referrals. We found a couple of videos on YouTube about how to make money without investing through the website and it turns out it was just a referral link, we thought it was something illegal or whatnot. For each new customer, Coinut.com will pay you 0.02 LTC and your client 0.002 LTC. Now when that client deposits at least 1 LTC or 0.01 BTC, you get another 0.01 LTC! Not only that, the company will also pay you the referrer a commission fee of 10% during the first two years of all your referrals trading within the website. Read more about the rules and regulations on how to get the referral bonus on this page. 2FA – Two-Factor Authentication is enabled on this website and you are able to activate it through your account. Just click on the settings tab and you will be redirected to the page wherein you are able to activate this security feature. Forum – We all know how forums work when it comes to online websites. Most of the time discussions made against or with a new exchange website happen on Reddit or at Bitcointalk. Here at Coinut.com, they have their own Forum which is great since discussions like coin issues, login issues, and “how to” advice can be found here. Now that we’ve discussed almost everything about Coinut.com, it would be best to talk about how to fund and take money from our accounts. It has been repeated a few times in this review that this website is a cryptocurrency oriented website; this means they accept a number of crypto currencies namely BTC, LTC, ETH, ETC, and USDT. Does the website accept USD deposits? Yes, they do. Here at Coinut.com, they made it easier for traders to deposit USD into their accounts if they go through their Customer Due Diligence which can be accessed through your account. The process requires the registered user to provide their Passport, Passport selfie, and Proof of Address in order to use USD for deposits and withdrawals. What about fees? Deposit and withdrawal fees start from 0.0001 per transaction but this isn’t clear since we did not have any balance on the account before trying to withdraw any funds from our account. The Fees part of the withdrawal tab shows that it can move to a higher decimal point depending on how much you want to withdraw. If you guys have a clear idea of how many percent of the withdrawal amount is the fee please do let us know in the comments section below. The screenshot above shows three parts of their deposit and withdraw page. The first part shows the deposit address for your Coinut.com account. The middle part shows the withdrawal tab where everything that you need to know about the withdrawal is shown. The bottom part shows the withdrawal requests that have been made along with status and time. Now comes the interesting part of an exchange. Most of the time, we only get part of what we expect to get when it comes to customer support. Websites would only have either email or chat but without a phone number, sometimes we only get an email, sometimes only a phone number. What does Coinut.com have? Sadly, they only have email support for customer service with social media accounts wherein people can also contact them. If you have any issues with the service or your account, you can go to their website; scroll down and the bottom part should contain the contact information needed to contact them. Provide your full name, subject, client email and the message. Alternatively, you can write them directly at support@coinut.com or give them a visit at 10, Anson Road, #26-04, Singapore (079903). Their Twitter account can be accessed here and their Facebook account through this link. Unlike some shady website that is registered somewhere offshore, Coinut.com is registered directly in Singapore and we all know how strict the country is. Knowing this makes it easier for traders to feel secured and would not have any second thoughts in using their website for exchange. The website has an account creation that would not take years to finish and they accept both BTC and USD, how awesome is that? They also offer futures and options trading that most people are looking for nowadays, which is a plus. They do need to add a few more pairs for people to exchange more cryptocurrencies through their website. All-in-all, this website is something that you should check out if you have the time. Their website is state of the art as you would not experience any lags or delays in changing tabs. A website that is worth your time!